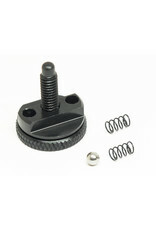 This new adjustment wheel is the ultimate addition to the Action Army complete replacement CNC Hop Unit for the newer model ARES Striker AS02 sniper rifle which is not only considered an upgrade but is in fact a necessity if you want consistent (or in some cases, ANY) performance from this otherwise awesome rifle. Ultimate precision quality at a price that is impossible to beat. Please note that this hop-up adjustment wheel is designed to work with the original ARES hop-up unit as well as the Action Army upgrade hop-up unit. The only difference in fitting is with the 3mm ball bearing, which must be installed if you have the original ARES unit.